Verdict: The production should’ve followed the original plan and left the film without any voiceovers, because as soon as the trailer with dialogues released, many people were already turned off by it, myself included. And largely because of the voiceovers, Walking with Dinosaurs: The 3D Movie has become just another formulaic animation for children, with educational introductions to every creature featured (popular species like T-Rex aren’t feature though), characters constantly talking (annoying as hell), and simple humour that may be completely unfunny to adults. No where as magical as The Land Before Time (1988) was. It does, however, have the best CGI-in-live-settings. The movement of the dinosaurs seem very real, and if it was without any voiceovers, the expression of the creatures would’ve been more significantly impressive. Second opinion: My girlfriend thought the voice-overs and constant dialogues are incredibly annoying as well but agrees that kids might like it and will find it educational. Patchi grows up in a family where the father is the leader of the group of their species, and the brother, Scowler, is a physically stronger but self-centred character who always bullies him and constantly wants to impress and boss people around. Patchi has a good supportive friend (a bird named Alex), conveniently assisting him, and sometimes conveniently not assisting him just so there’ll be more drama in the story. As the story goes on, Patchi meets the love of his life (named Juniper), his parents die, Scowler takes over to become the new leader and expels him from the group. In the end, Patchi leads the group in defeating a bunch of carnivorous dinosaurs and saves everyone from being eaten. He reconciles with Scowler, becomes the new leader, and have plenty of kids with Juniper. The en… hey, are you asleep?! To watch in 3D? Well, it is marketed as a 3D movie so it really defeats the purpose if you didn’t catch it in 3-D. However, when I saw it at Cathay eCurve, the 3D depth was less significant than the trailers shown before the movie. Also, in some scenes, it’s kind of blurry with minor double vision, and I wasn’t the only one who noticed it, so I guess you’d probably have to make due, or ask around to find a cinema that can cater 3D viewings better. Malaysian censorship: It’s a kids animation, there isn’t even much blood or flesh shown in sequences with the dinosaurs biting and dying. Synopsis: For the first time in movie history, audiences will truly see and feel what it was like when dinosaurs ruled the Earth. 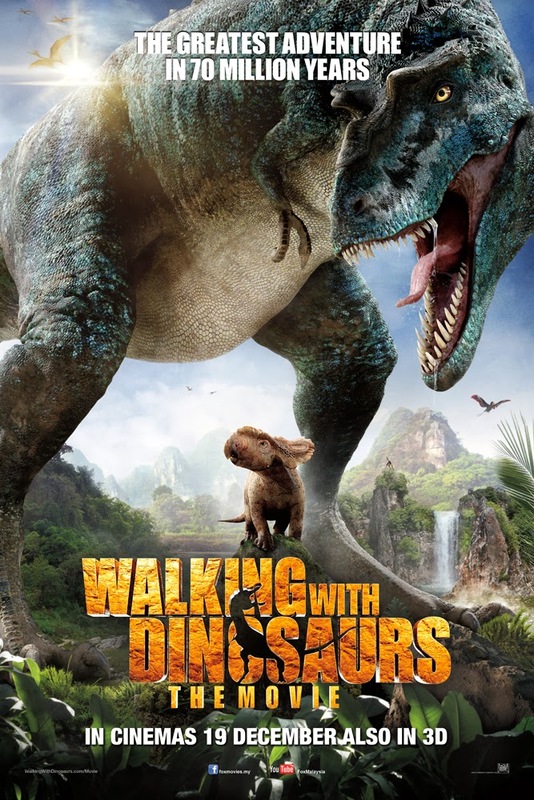 WALKING WITH DINOSAURS is the ultimate immersive experience, utilizing state of the art, photo-real 3D to put audiences in the middle of a thrilling and epic prehistoric world, where an underdog dinosaur triumphs to become a hero for the ages. Based on the massively successful TV series and live show, which has grossed more than $250 million in box office worldwide.